When I tried the Zeiba Tree I had expected a much woodsier fragrance than I actually got. While it does contain a bit of sandalwood, the majority of the fragrance depends on its fruitiness to get by. In Bottle: Fruity and sweet, like lemons, peaches and–for some reason–a little bit of apple. Applied: Perhaps it’s the citruses (particularly lemon) mixing together with the ultra fruitiness of peach because I smell a little bit of apple in The Zieba Tree. It’s odd, because it’s more of an authentic apple note than any of BPAL’s actual apple notes. I quite like it even as the sandalwood waffles in and out of the fragrance like it’s uncertain whether or not it wants to hang out or get out of there. The musk in this fragrance is a very light clean musk that makes me think of a tree that someone’s soaped up and scrubbed down. The rest of the fragrance isn’t too deep the resins add a little more of a tree-like quality to the fragrance but in general, The Zieba Tree is a predominantly clean and fruity fragrance with little hints of sandalwood. Extra: The Zieba Tree, being a mythological entity was said to have housed bare-chested individuals in its branches. Design: Bottled the same way as most of Black Phoenix Alchemy Lab’s other 5ml fragrances. Notes: Sandalwood, musk, resin, davana, lemon blossom, orange blossom, white peach. I’m rather delighted at how fun the morph was when I first applied this and smelled apples. I’m not the only one who noticed as many other Zieba Tree testers have noted a whiff of Ye Olde Forbidden Fruit too. 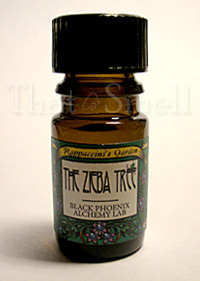 Reviewed in This Post: The Zieba Tree, 2009, 5ml Bottle. This entry was posted in black phoenix, fruity, Reviews By House and tagged davana, lemon blossom, musk, orange blossom, resin, sandalwood, white peach. Bookmark the permalink.